A United Launch Alliance Delta II rocket, on behalf of Boeing Launch Services, successfully launched the third Italian-built Constellation of Small Satellites for Mediterranean Basin Observation or COSMO-SkyMed 3 satellite at 7:28 p.m., October 24. 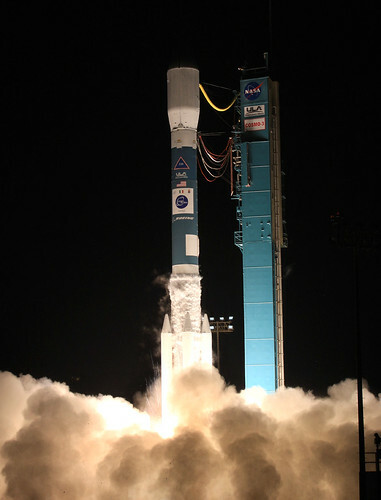 ULA successfully launched the first two Cosmo satellites on Delta II vehicles June 7, 2007 and Dec. 8, 2007. "ULA is pleased to have successfully launched the third of four critical Earth observation systems in this series for Boeing and Thales Alenia Space," said Jim Sponnick, ULA vice president, Delta Product Line. "With this 43rd successful commercial launch, the Delta II system continues its record of mission success, which is unparalleled in the U.S. space industry. This achievement is due to the hard work of our professional engineers and technicians along with the tremendous support we receive from our government, industry, and supplier mission partners. We look forward to many more Delta II launches in the years ahead." Blasting off from Space Launch Complex 2, it marked the fifth successful Delta II vehicle launch procured by The Boeing Company through its commercial launch business. The ULA Delta II 7420-10 configuration vehicle featured an ULA first stage booster powered by a Pratt & Whitney Rocketdyne RS-27A main engine and four Alliant Techsystems (ATK) strap-on solid rocket boosters. An Aerojet AJ10-118K engine powered the second stage. The payload was encased by a 10-foot-diameter composite payload fairing. ULA began processing the Delta II launch vehicle in Decatur, Ala., nearly two years ago. In February, the 1st stage arrived from Decatur followed by the 2nd stage in August. The vehicle was erected on its stand at the pad Sept. 16, with solid rocket booster installation completed Sept. 19. Hundreds of ULA technicians, engineers, and management worked to prepare the vehicle for the COSMO-3 mission. Developed by Thales Alenia Space, Italia for the Italian Space Agency and the Italian Ministry of Defense, COSMO-3 is the third of the four COSMO-SkyMed satellites. Each satellite is equipped with a high-resolution Synthetic Aperture Radar operating in X-band and is one of a constellation of four radar satellites. The overall objective of the program is global Earth observation and relevant data responding to the needs of the military and scientific community, as well as to the public demand for environmental control. This entry was posted on Monday, October 27th, 2008 at 5:33 am	and is filed under Around the Blogs, Observation, Satellite TV. You can follow any responses to this entry through the RSS 2.0 feed. You can leave a response, or trackback from your own site.